Last night I found a pretty, but VERY simple lacy serrated lace edge I like—in my stand by resource—Nicky Epstein’s Knitting On the Edge. I modified it a slightly and I am working it in 2 colors –grape color closest to cowl, raspberry as the edge. I’ve just got 2 repeats done, and it’s hard to see the detail now (because the work is bunched up.) I modified the pattern and added a gutter of 2 purl stitches-the color change takes place in this gutter—it makes the edging a little wider, but it’s still pretty narrow. The gutter and color changes clearly make the grape faggoting and the Raspberry serrated element separate. The edging is over 2 inches. And will bring the finished length to over 9 inches. Plenty big enough! The last 3 rounds of the cowl were worked in the hand painted ArtYarn merino, in garter—and before the edging the cowl is 7 inches from end to end. Speaking of ends, the end is in sight for this project—and not soon enough since the weather forecast is for biting cold wind and snow. Not the ½ dusting that NY got over the weekend, but real snow –the kind the Mid-Atlantic states got (and will be getting more of)-- Real winter weather. I dreamt about the other border I need last night (really!) and will swatch it today and see if it is really my dream border… or some crazy nightmare! I still need some other swatches for my Knit from Stash, Original design Ravelympics entry... but—well, those are less of an issue. My V shawl is going to be knit from the lower point of the V—and then the two sides will be worked at the same time. One advantage to having 7 balls (vs. a large skein) is it will be easy to work both sides, each with their own ball of yarn. Ultimately, my goal it to have a knit in place border—not one that requires me to pick up stitches and knit after (or worse, knit and sew in place! )— But I want a border that is different, (but not too hard)—and one that will easily allow me to increase as I go. I am so demanding! 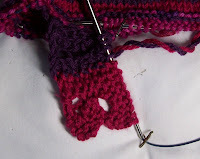 Notice—that is what I am doing with the Fruity Cowl—I am knitting the border on, as I cast off (in effect). think I know which cast on, and which cuff I will be using—and the top of the sock has been reasonable well thought out. The stems and leaves? Not so much... I know I want a stem--that’s easy enough to knit—there are lots of ways to make a nice thick stem (a cable? Slip stitches? (a slip stitch pattern is, for now, the most likely choice) or some knit and purl combination? But the leaves…mmm, not so easy. I’ll keep thinking about it... and looking… there is a textured stitch pattern called tulip leaves. Maybe it can be modified into narrower hyacinth leaves. But I also have an idea for a much detailed leaf. (Maybe I will use it in the front of the socks, and not the back (or maybe the other way round!). There are other details too, like stitch count (how many stitches for the flowers—and the flower stitch itself, how stretchy is it? Do I need to add extra stitches for the sock (as I would for cables) and the dimensional aspect too. How do I make each hyacinth stand out (and appear to have more depth?) should I rib between each flower? Or just do purl stitch ‘gutters’? (should I swatch? YES. Will I? Maybe! I wore my passionate purple petal socks last week for the first time—(I finished them at the end of November, and I have been petting and admiring them for the past month!) –I thought about them for a while before I knit them. Some times socks (even relatively simple socks!) require a good deal of thought before they are knit—and luxuriating in after they are knit. I am lucky to be able to knit socks in my leisure, and not for necessity.. And to have fancy socks as well—and the opportunity to wear them. Thank you for the reminder about fancy hand-knit socks. Yes, leisure IS a treasure. Lovely post. Yep, I think that NYC is going to get walloped with this one. On my way home tonight I saw a few flakes already falling. Kinda excited! I'm definitely going to have to pick up a copy of that N. Epstein book. I'm not really wild about her designs, but her techniques (even within patterns) are definitely worth stealing.